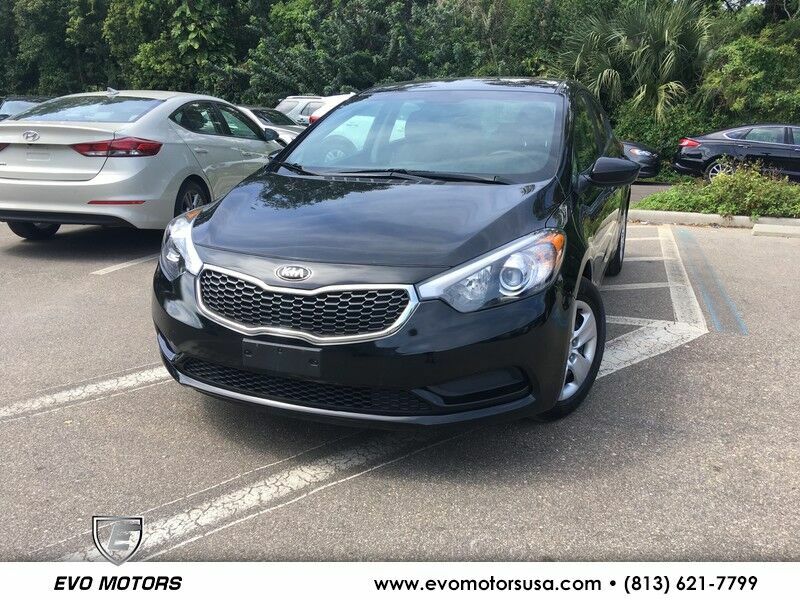 ** 2016 KIA FORTE LX ** ONE OWNER ** BLUETOOTH ** GREAT GAS MILEAGE ** Evo Motors is honored to present a wonderful example of pure vehicle design... this 2016 Kia Forte LX could potentially be the vehicle of your dreams! When it comes to high fuel economy, plenty of versatility and a great looks, this KiaForte LX cannot be beat. This Kia Forte's superior fuel-efficiency is proof that not all vehicles are created equal. This 2016 Kia Forte has such low mileage it has been parked more than driven. More information about the 2016 Kia Forte: The Forte is a compact that's one size down from the Kia Optima and one up from the Kia Rio. It competes in a crowded segment, against some very established nameplates like the Toyota Corolla, Honda Accord, Nissan Sentra, Hyundai Elantra, Volkswagen Jetta and Ford Focus, as well as the Chevrolet Cruze and Dodge Dart. The Kia Forte stands out for offering a little more equipment for the same price -- as well as some standout comfort options, such as a heated steering wheel and cooled driver's seat. There's also a choice between three engines, a fuel-efficient 1.8L, a stronger 2.0L or, in the 2-door Koup, a 1.6L turbocharged unit. Every buyer should be able to find the right combination of power and fuel economy. This model sets itself apart with choice of powertrains, fuel-efficiency, standout comfort and convenience options, great list of standard equipment, and Stylish exterior. ** FINANCING AVAILABLE ** CALL**813-621-7799 ************* ORIGINAL PRICE ************* **To receive the lower advertised price or Preferred Payment discounted price purchaser must purchase the vehicle using one of the following preferred payment methods: Cash, Cashiers Check without lien recording instructions, Capital One Auto Navigator pre approval, or Financing through the dealership with an Approved lender. **YOU MAY CONTACT THE DEALERSHIP FOR A LIST OF APPROVED LENDERS **. A list of approved lenders maybe requested by email or talk to a sales representative. If buyer is purchasing the vehicle using any other payment method ORIGINAL price will apply. **All Truecar price certificates will reflect ORIGINAL price** All prices advertised on any Credit union or third party lenders buying service facilitated by third party websites are original prices and not the discounted price. customer may choose to receive the discounted price if they pay for the vehicle with a preferred payment method. Legal Disclaimer: The entire contents and information of this website is deemed reliable but not guaranteed. (IF APPLICABLE) Sales Tax, Titling and registration cost and $599 Dealer Service Fee are additional to the advertised price EVO Motors is not responsible for typo graphical errors. The information in any online vehicle listing is deemed reliable but not guaranteed, Purchaser must verify all listed options and description before finalizing a purchase. Sold vehicles may not be removed immediately from online listings, shopper must call ahead to verify availability and pricing. There is no such thing as a perfect used car shopper must expect wear and tear. Prices may change at any time without a prior notice. Selling Dealer does not manufacture vehicles offered for sale nor guarantees the quality of materials or accessories installed on any vehicle. The information in any vehicle description may not be considered a promise of warranty or as a statement about the condition or the history of the vehicle. EVO Motors does not pay for shipping charges for out of State or local purchasers. It is the customer's sole responsibility to verify the existence and condition of any equipment listed. Neither the dealership nor AutoRevo is responsible for misprints on prices or equipment. It is the customer's sole responsibility to verify the accuracy of the prices with the dealer. Pricing subject to change without notice.